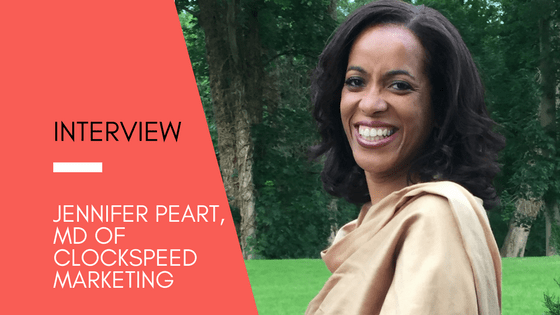 Consultant and CIockSpeed Marketing MD, Jennifer Peart, discusses the business models and pricing strategies she uses to achieve her financial goals. She advises when to walk away from a prospective client and when to take a chance. 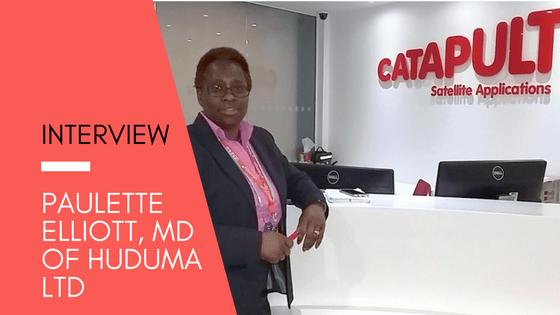 She also explains how networking and digital marketing play a vital role in sourcing clients; and how she successfully scaled up her business whilst remaining a sole entrepreneur. So whether you’re an aspiring consultancy or a growing business in another sector – read on and find out how she has achieved her success and get inspired…..
Jennifer is a fantastic example on how to achieve your goals and then some. Her success is down to her ability to add real value; work with a genuine team ethos; and her vivacious personality! Silicon Valley (USA) for 2 years. Matrix-management of international teams. Product and Marketing Consultancy for 14 years: PE backed companies; private and government / regulated organisations; B2C and B2B in blue-chip multinationals, SMEs and start-ups. None that can mentioned by name due to confidentiality. SD: When did you decide you wanted to become a marketing consultant? 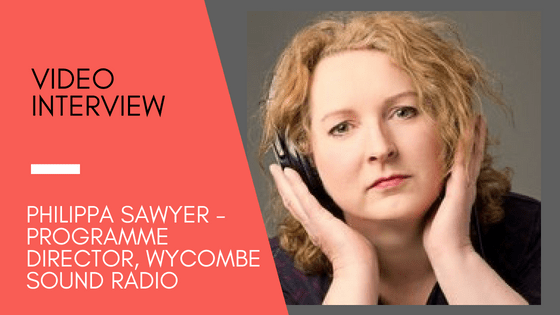 Jen: I describe my decision to become self-employed as an ‘accidental interim’. It was sometime after I returned from a two year secondment in the US. There came a point where the thought of doing another marketing directorship in the same type of company in the same sort of sector didn’t appeal. I didn’t really know what I wanted to do, so I took a bit of time off. Those were the days when you could walk into another role quickly so it didn’t seem a big risk to leave a job. SD: When you became a consultant how did you figure out your rates? Jen: When it came to the charging rate there was almost two sides to the coin. If it was someone senior I knew, I could go in and charge what I knew I was worth – but outside of the network it was a bit of a battle in the beginning. Because, even though I was relatively senior – I was new as a consultant. I then had mentoring from a seasoned consultant, and I when I started working with other consultants, they would tell me that I was way too cheap. So sometimes you can naturally know you’re worth and other times it’s when people make you realise your worth. It’s knowing that if somebody wants your services then they have to pay for what you value your worth is. ” I quickly learnt that there is a ‘scientific’ approach and an industry expectation as to how you work out your rate. For straight consultancy work, going on a day rate, is where I find prospects will try and beat you down easily.’’. SD: Can you explain more about the pricing model you use as a consultant? Jen: The initial pricing model I used was a straightforward 1 to 1 relationship model: I’m going to charge the client an x amount. And because I can only charge one of me – it was like – oh my gosh – how much do I charge for myself? Because you definitely need that belief in yourself. Thankfully, I quickly learnt that there is a ‘scientific’ approach and an industry expectation as to how you work out your rate. For straight consultancy work, going on a day rate, is where I find prospects will try and beat you down easily. So for a consultancy project I would generally charge for the value of the project. If I was going to charge a day rate on a project, I’ll estimate the amount with some contingencies and that way it’s not valued on the number of days. As long as you yourself know how long it will take, you’re not losing money, and you’re delivering value to your client, then that’s fine. So that was valuable learning I got early on. SD: Are there any exceptions when you don’t stick to your pricing model? Jen: Some projects may have a small budget but if I find the project really interesting or I can see it as a stepping stone to future projects, I’ll consider it. I still have to make it work for me as well as for the clients and sometimes in those scenarios I would say ok this is really interesting and I would normally charge this but I’ve got quite a strong belief in what you’re doing so I would like to be involved in the project, let me understand how I can work with you so I can get involved. So there are different ways of being able to flex your model without giving away your value. It’s really tough at the start to walk away because you’re not prepared for doing it for that amount – I simply let them know that it’s ok if you can’t pay this right now – I’m just not the right person for you. It’s only in the later years that I felt comfortable to say ‘’ I’m not going to do that’’. ”Sometimes you can naturally know you’re worth and other times it’s when people make you realise your worth. If somebody wants your services then they have to pay for what you value your worth is”. SD: How does your business model work from a scalability point of view? Jen: The model from a scalability point of view works well for consultancy. It does vary but I tend to average about 3 or 4 projects at any given time. I’ll aim to work on XYZ projects and I’ll commit set amount of time/days to each project. I’ll charge an x amount for the deliverable in set amount of time but how I manage my time is up to me – that means I can also see other clients. The more challenging model is to block out an extended period of time for one project – it really doesn’t work on a scalability as it takes you out of the marketplace and your network. And the only way you get a certainty of work in order to forecast your income is longevity. And that’s by having a good business model. 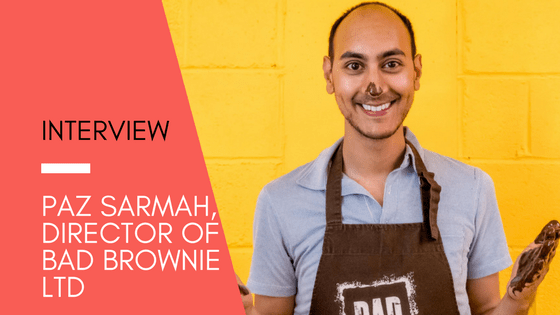 ”Outsourcing to freelancers is a very easy model to follow and I definitely recommend it if you want to grow your business and scale up as a consultant”. SD: In order to scale your business further, you outsource. How does working with freelancers fit in with your business model? Jen: Outsourcing to freelancers is a very easy model to follow and I definitely recommend it if you want to grow your business and scale up. You save on overheads, and you don’t have to deal with the requirements associated with having employees. At some point you may need to take on someone permanently but from the outset you’re not accruing costs unnecessarily. It’s important to know their rates upfront but it’s an easy conversation to have. The freelancer will give his/her rate and I’ll add that to the project costs with a desired mark. This is then what I charge the client. SD: You also freelance for other consultants. How do you navigate around any conflicts of interest? Jen: Yes on the flip side I get other consultants asking me to join them on projects – so I become their resource. I tell them my rate but I never ask the question how much the project or what they are charging is – it’s none of my business – my relationship is with the consultancy not their client. I also always go in under their company brand for instance. I never go in as my own consultancy when operating as part of their team. It’s also my personal thing to make that distinction. And it also instils a level of confidence in the other consultancy. The other side of the coin is that it protects my brand integrity as ClockSpeed Marketing and when I take on freelancers I need to know they meet the mark as it impacts my brand identity also. And when you’re assessing new freelancers you do need to trust your gut and see and know if they are as good as you want them to be. Whilst you are reaping the benefits of new projects, you are always looking out for the next range of projects. With a small team, it can be difficult to manage and also difficult to scale – but it isn’t impossible. SD: How does networking play a part in growing your business? Jen: I network like crazy. There’s the personal networking (meeting for dinners etc.) where I tend to put on the weight! And the networking events, which don’t yield any clients but it expands my network of like-minded connections – and gives me valuable exposure – otherwise you can feel quite isolated as consultant. SD: What role has digital marketing played in the success of your business? Jen: Over the years it’s increasingly playing an important role. I focus mainly on LinkedIn, my website, and pay for click advertising (PPC). The latter, especially, has helped increase my visibility amongst my peers and when I’m seeking prospective clients. SD: How much of your digital marketing do you outsource or do inhouse? Jen: It’s all handled in-house by myself. However, I did use an associate web design agency to update my website. I am often asked to undertake digital marketing on behalf of clients. Depending upon the size of the project I will do it myself or if much larger, engage one of my associate organisations. SD: What has been your biggest challenge as a consulatnt and SME – and how have you met that challenge? Jen: Feast and Famine! Whilst you are reaping the benefits of new projects, you are always looking out for the next range of projects. With a small team, it can be difficult to manage and also difficult to scale – but it isn’t impossible. Jen: I wish someone had told me to think bigger and believe more in yourself – you would be amazed how much you can achieve and how much other people believe in you. SD: What’s the most exciting thing in the horizon for you and ClockSpeed Marketing? Jen: Some exciting projects which expand the current offerings – more into the app development space. Also I’m working a lot more with the start-up community as well; which is quite a change of pace from the standard corporate businesses!